An interesting journey with Andres Olguin, biologist and Buenos Aires chef Cristian Gomez, highlighting marine resources regional importance. On this occasion, the chosen ones to share their experience were Andres Olguin IFO´s) Biologist and researcher; and outstanding Buenos Aires Executive Chef who works at Valparaiso Cafe Turri, Cristian Gomez; accompanied by Veronica Muñoz, PUCV Cultural Extension Chief Journalist, in charge of moderating the space on this occasion. Cristian the Chef added: “These meetings around food with a scientific view and gastronomy are quite interesting. As a chef, we promote consumption by informing the population about the benefits of consuming certain products, such as algae, so that people can incorporate them into their diet and get used to their consumption. “In another issue, closures, it is everyone’s responsibility to respect that if a fish is closed it is banned; In restaurants, Menu has to inform customers if a product is closed, so they know they can not ask for it; in this way, people get informed and get used to the fact that they will not find that product at that certain period of time, “he added. 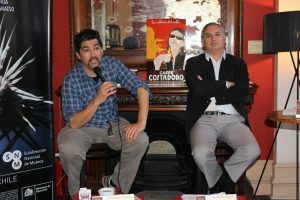 “A Cafe with Valparaiso: Science and Everyday Life” is a cycle of talks that addresses different topics from a scientific and patrimonial perspective in a format of close conversation accompanied by delicious coffee. This activity is organized by Valparaiso Natural History Museum together with Regional Associative Project (PAR) CONICYT Explora Valparaiso, with Valparaisologia cafeteria, Costadoro coffee participation. Valparaiso Natural History Museum is an active member of Scientific Culture Network of PAR Explora Valparaíso from CONICYT, an institutional science, culture and technology network committed to the development of scientific culture in the region, through initiatives such as this one. Each year activities are carried out within the National Science and Technology Week framework.